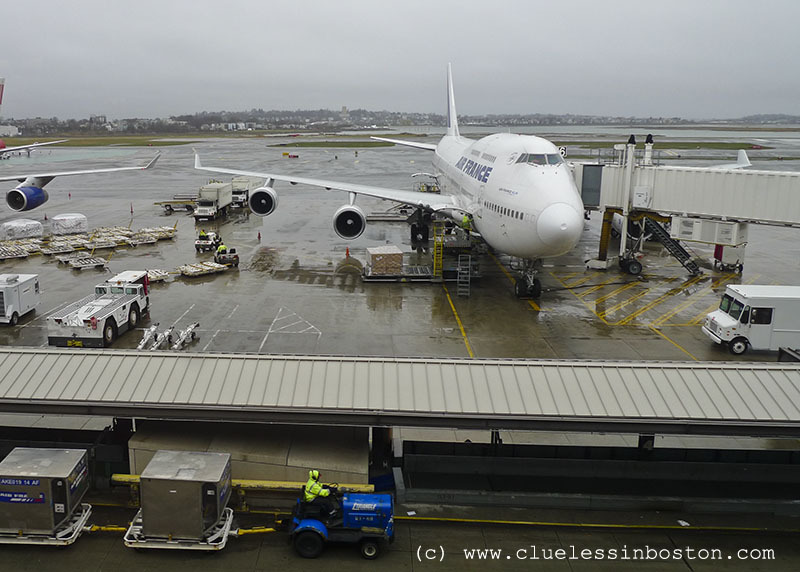 This is our plane being readied and loaded for the scheduled flight to Paris. Upon checking the aircraft prior to boarding, damage was discovered on the nose of the plane, which was caused by impact with a bird. The airline decided to ground the plane and cancel the flight until replacement parts could be flown in from Paris. Below is a closer look at the dimple on the nose of the jet. I, along with over 360 fellow passengers were quite dismayed when the flight was canceled. However, I was able to call Air France and was booked on an Aer Lingus flight leaving at 6:20pm the next night, which was great because it is school vacation week and ALL FLIGHTS are booked. 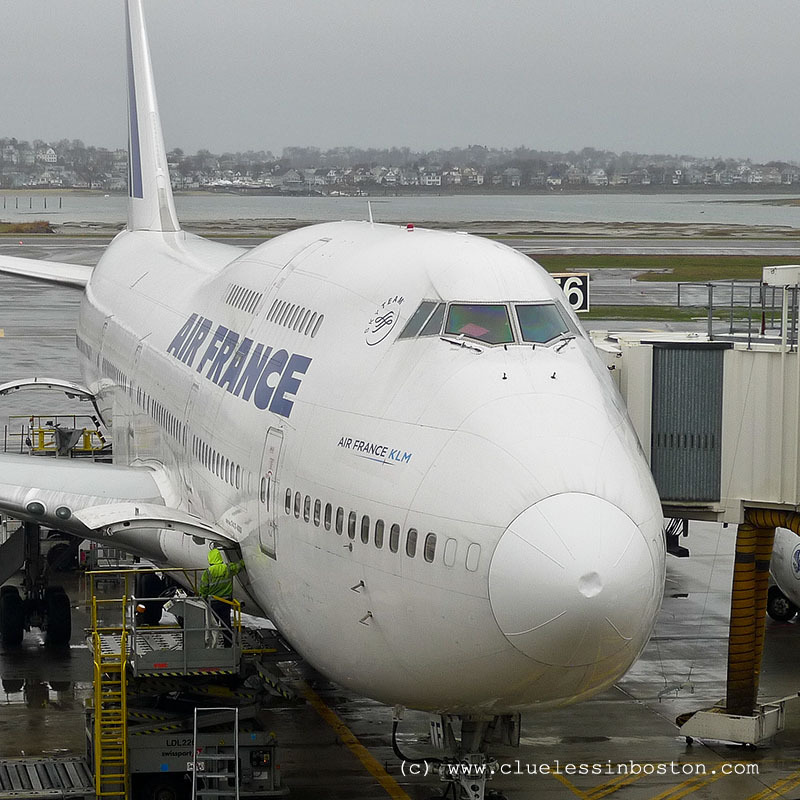 I really appreciate all of the people at Air France who, either on the phone or at the terminal, were extremely helpful and courteous under very stressful circumstances. Now on to Dublin for my connecting flight to Paris. A bird did that? WOW! Bon voyage! Dang birds that make airplane nose dimples! Hope you'll meet Lauren with the Paris CDP blog or Ciel with the Versailles CDP blog! Ah, this post makes me feel like going somewhere! Excellent! Glad you were able to make it. Have a great trip! I wish you a more quiet trip for the next touchdowns to come. I hope you'll enjoy your time in my native town, and then your days in Prague, and with your son! Glad that you were able to get on another flight so quickly. Perhaps you can meet up with Genie http://parisandbeyond-genie.blogspot.com/ who is in Paris right now. I was in Paris last April and had the best time -- know you are going to have such great fun. My goodness! Nice shot of the damage. I'm surprised they told you why the flight was grounded. Bon voyage! I have read that birds are a grave danger to aircraft and cause thousands of dollars in damage every year. But how sad to have your flight cancelled. I love Paris and would have freaked out! Glad that you were able to work it out and hope you have a wonderful time in that great city! That's incredible damage. Wow! There's nothing worse than having your flight cancelled at the last moment. Glad you made it on another flight so quickly and easily. Enjoy your visit in Europe and I'm sure you'll bring back fantastic photos. Fortunately you can continue the way ... Ah Paris, Paris! This is so Rare to hear some kind of compliment on Air France!! You have a sensible and calm reaction to the delay. So often I hear people raging because they were inconvenienced. Do they want the airlines to fly a damaged and dangerous plane with 360 people on it? Paris and Prague? You are very fortunate. Two wonderful cities, plus your son. Enjoy your trip. Amazing what a bird can do... make many lives miserable for a time. Great trip!